It's a full-sized ride though, and a great option if you want a 'proper' bike for town riding but could do with saving a bit of space, or you have a mixed commute and you need something to stick in the car. The main talking point of the Montague is the frame design. It's a full-sized Aluminium folding platform that comes in a couple of different incarnations for MTB (branded as SwissBike) and road wheels. The fold is by virtue of a rotating seat tube section: undo the quick release on the top tube and the rear triangle folds round, and you can drop the seat to make the whole thing a bit more compact. It's not like a Brompton or other small wheeler that you can hop onto the tube with, but it is a useful size reduction if you want to fit it in your boot or stash it at home, and it will fit in the bottom of an inter-city luggage rack too. The fold can be achieved in 'less than 20 seconds' according to Montague; in practice I found it took about twice that after a few goes. That's plenty quick enough for the kind of situations you'll be folding or unfolding it: in the car park, at the office and so on. This incarnation folds out into a city singlespeeder with flat bars and a 42x16 gear that's about right for urban riding. The kit is all dependable if largely uninspiring stuff: SR Suntour cranks, Formula hubs on Alex rims, Promax brakes and a bunch of unbranded bits and bobs to finish. So to the ride. Usually when you're talking about a folding bike there's plenty to talk about on the subject of how the fold affects the ride, but not here. I wouldn't advocate riding blindfolded but were you to try it you'd be hard pressed to tell this was a folder, there's nothing to give it away. The mainframe is nice and stiff without being overbuilt to compensate for the fold, the geometry and riding position completely normal with a fairly upright stance that's just about right for shortish town journeys. You can even fix it up if you want, the folding mechanism doesn't affect the integrity of the rear triangle and a flip-flop hub is standard equipment. The single gear is a good balance between flat speed and climbing ability, okay for the steep hills of Bath but better suited to London where it also got an outing during testing after we lobbed it on the train. The steering is neutral and the bike's reasonably low overall weight means you can muscle through the traffic easily. Haul on the anchors and you can pull up without fuss; the brakes aren't top drawer but there's plenty of power there. If you're going to be spending lots of time hauling the bike about in its folded state then it's worth investing in the carrying bag. The straps attach to the frame of the bike and the hardy cover encloses all the greasy/sharp bits. It's much easier to carry once it's bagged, and your boss will be glad that your bike isn't leaking its fluids onto the office carpet as well. What are the downsides? Well, you pay a premium for that folding technology, meaning that you don't get quite as much singlespeed for your cash, and the bike though functional isn't as stylish as some of the non-folding fixed gear competition. But if you struggle to find space for a full-size bike and you don't want to sacrifice ride quality, the Boston is a good quality bike with a full-sized feel and a reduced footprint, and definitely one to look at. We've now had a chance to ride not one but two Montagues; the singlespeed one above and the Nexus 8-speed version of the same bike, pictured below. Effectively it's the same bike, just with a slightly different build. Instead of the singlespeed drivetrain you get Shimano's Nexus 8-speed hub, with a twist shifter to tun you through the ratios. The dropouts are forward-sloping rather than backwards horizontal (to be honest, either would work fine here) but aside from that the frame is the same one. 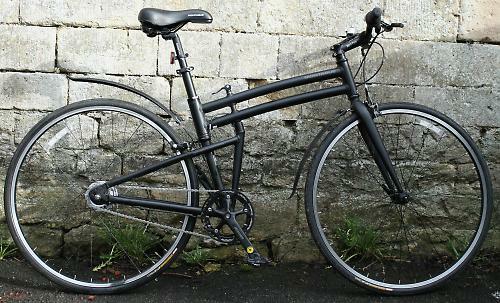 Current list price for this model on the Montague UK website is £720, £150 dearer than the singlespeed (now £570). So, how does it stack up? Well, given that it's the same frame the same riding notes mostly apply. The bike doesn't ride like a folder; there's no hint of any hinge-related flex and the neutral steering and ride position make it feel like the mid-range hybrid it would be without the folding mechanism. Eight speeds is a lot more than one though (it's seven more: ed) and that makes it into more of an all-purpose utility machine and extends its range and, I'd say, appeal. The Nexus hub lacks a bit of the refinement of the dearer Alfine in the shift but it's a likeable unit and there's no one gear that feels particularly laggy. In fact the Boston 8 was happy to clip along at a very decent pace, managing the 5-mile commute home (up a big hill) only a couple of minutes slower than my benchmark Genesis Equilibrium. The ride position doesn't exactly encourage standing up effort but the Boston is more than happy to spin up the hills; for lumpy Bath the bike could be geared down a ratio but the range is pretty good. Given that you may decide on longer rides on this Boston, you'll probably want to swap the saddle out for something a bit better built, as it starts to make itself known at around the 10-mile mark and is pretty uncomfortable not long after that. It's not a difficult swap though. Weight wise the Nexus bike stopped the needle at 12.65kg (27.9lb), 2kg heavier than the singlespeed version, but it wasn't noticeably more slovenly as a result. In fact I was impressed at the Boston's ability to keep a good pace. The more utility-oriented 8 comes with quick release mudguards as standard. These attach to brackets fitted to the brakes and can be clipped on and off with a flick of a cam lever. They only extend backwards and they're a bit bouncy, but the do a decent job of protecting you from the worst of the road spray. If you're packing the bike up small, they're very simple to remove. The Boston isn't for everyone but it's a simple job to imagine a scenario where it's the best option by far. If parking space at either end of your commute is limited, or you want to do a mixed commute with a fairly long ride, then this is certainly a machine to look at. The 8-speed version extends the range somewhat at the cost of an extra 2kg, but overall is the better of the two. Don't think of it as a folding bike, more a full-size machine with a small footprint. Frame Custom drawn 7005 Series. 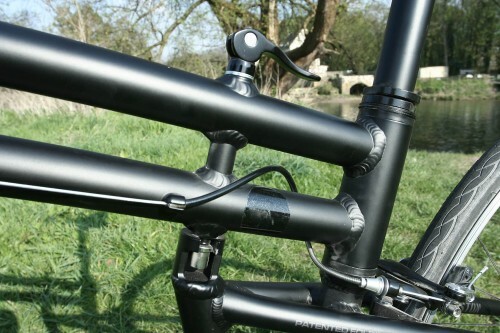 Aluminum tubing with horizontal dropouts and FIT System. Tyres Kenda Kwick Roller Sport 700c x 28mm slick. The Montague Boston™ is a full size, single-speed folding bike featuring 700c- wheels for ideal riding in the city. It also includes a flip-flop hub so the rear wheel can operate as either a fixed-gear or free-wheel setup. The Boston is a fast bike for the urban rider who wants simplicity with excellent performance. 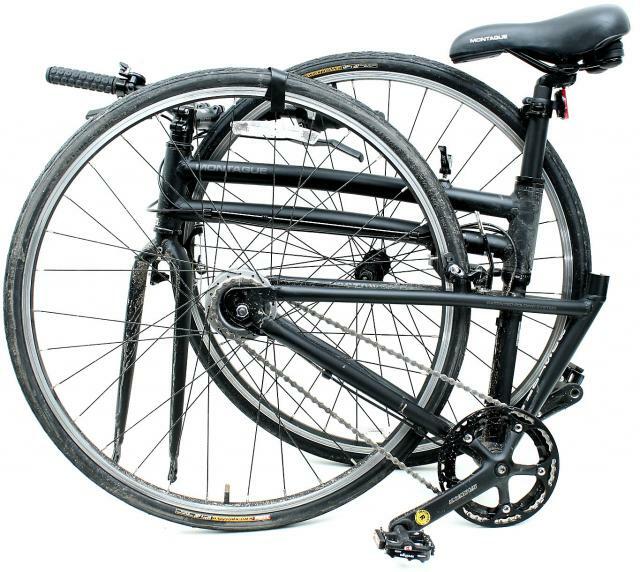 The Clix quick release and the patented folding system convert the bike from full-size to trunk-size (35 x 12 x 28 inches) in less than 20 seconds. 20 seconds for the fold is optimistic but otherwise there's little to argue abut here. Easy to ride just about covers it. Well behaved and comfy. Thanks for the informative and honest review. Looks like all standard components which is nice when compared to to other folders. And I like that you got it nice and dirty before taking those pics. nope, bottom bracket is standard. 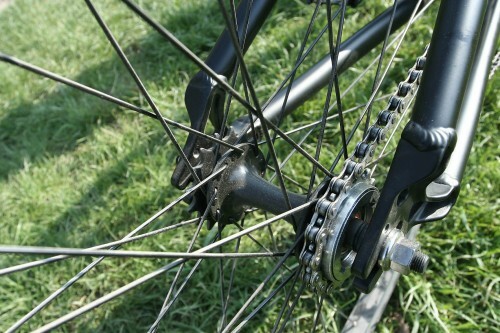 chain tension doesn't need to be super-high with a hub gear, tugging the wheel back normally gives enough tension. or you can walk it back by tightening the nuts in turn and moving the wheel sideways to walk tha axle back along the dropouts. Love a Gates Belt Drive version. An interesting bicycle that I just purchased the Boston 8 version with nexus hub but have yet to ride it. But a word of caution, so others who are interested in this bicycle don't make. The bikes comes with Kenda Kwick Roller Sport 700c x 28mm slick tyres which I have tried upgrading with 700cx28mm Continental 4 season tyres. The latter does not fit and I had a mamouth task trying to get them on so took them today to my lbs who had a go and came across the same problem as me once they are eventually on. The gap between tyre bead and rim are not even on all sides which means you get a 1cm gap. He has suggested the same tyres or another of my choice but with larger tyres 700x24mm. So either Kenda Kwick make much larger tyres then their stated size or Continental 4 seasons make much narrower tyres or something to do with the rim. In any case I've gone with the Schwalbe Marathon and looking forward to picking it up once its had its once over. On another note as this bicycle will be transported regularly by car. Will putting the bicycle on its side cause the chain to keep falling off when in my car boot as I noticed that this happened when taking in the car to the local lbs? I would have thought there would be enough tension on the chain to prevent it dropping off a hub gear setup. However, it's always a good idea under any circumstances to transport a bike chain side up if it's going flat in the back of a car. That way you're prevented from lying the chain itself against anything in the boot that will help unship it. Cleaner, too. On a derailleur-geared bike always put the chain on the biggest sprocket at the rear and the extra chain tension will keep it in place. the rims are stock standard Alex affairs, so not sure what the issue is there. I didn't have cause to swap out the tyres during testing. On the subject of the chain, if you have the correct tension in the chain then it should be resonably difficult to dislodge, although it would be possible if something was pressing on the chain and the pedals got knocked back. Just a quick up date, yet to ride the bike yet as waiting for the weather to get better here. But my lbs ended up fitting 700 x 32c Schwalbe Marathon Plus tyres to the existing wheel rim for anyone contemplating it with this bike. One thing you may have missed is another difference in the frames. The Boston has a 120mm OLD spacing at the rear track ends. The Boston 8 must have a wider spacing to accomodate the Nexus (somewhere between 126 and 132 probably). 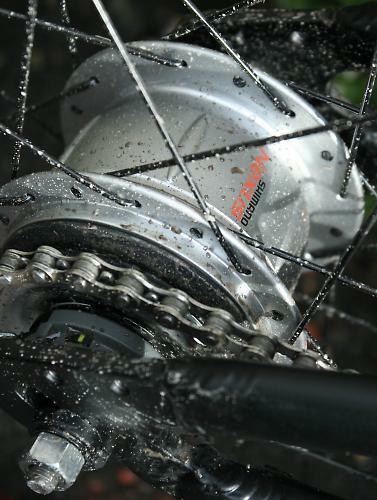 The Boston 8 has 135mm rear spacing to fit the Nexus hub. I got my hands on a used Boston 8 frame and did a fixed gear conversion with it. I had my lbs built a custom wheel to fit the wide spacing - very wide by track hub standards.